Thanks to Sherlock's three-episode season structure, the acclaimed BBC drama has come and gone in what feels like the blink of an eye. From the ghosts of Mary Watson's (Amanda Abbington) past to Sherlock's (Benedict Cumberbatch) own history - with a devilish new villain in between - the series has certainly explored some interesting territory. Unfortunately, the season finale, "The Final Problem," has left quite a few fans dissatisfied - in large part due to the number of questions that the episode raised and never resolved. Sherlock has had its issues with plot holes before, but "The Final Problem" was more like a rickety wooden bridge stretching across a gaping plot chasm. The show's fans have defended it, and co-creator Mark Gatiss has responded to audiences who find the show hard to follow with the recommendation, "Go and read a children’s book with hard pages if you don’t want to be challenged." However, while it's true that not everything has to be explained to the audience, "The Final Problem" could definitely have done with a bit more exposition. Here's a breakdown of the biggest and most confusing plot holes in the season finale. It's nice to get episodes off to an attention-grabbing start, but it's hard to know what to make of Mycroft's (Gatiss) experiences in the opening few minutes of "The Final Problem." At first he appears to be suffering from a terrible nightmare that features a clown with a sword, a little girl in a dress, and a string of home movie clips but - in a twist on the "It was all a dream" gambit (Sherlock has already used that one, and employs it again in this episodee) - the events are not a dream at all. It's actually all a pantomime cooked up by Sherlock, to get Mycroft to sort-of confess to the existence of a third Holmes sibling and hopefully at some point in the process reveal new details about her. This was no small operation, either. Aside from the actors that Sherlock had to find for the roles of young Eurus and the sword-waving clown, he also had to rig paintings to bleed from the eyes and find a young girl to record dialogue to be played back over hidden speakers in Mycroft's house. He also had to know which movie Mycroft had been planning to watch that evening, and painstakingly cut it together with Holmes home movie footage. While it's not outside the realms of possibility, this stunt would have required a staggering amount of set-up. Surely a mind as brilliant as Sherlock's should probably have been able to figure out a slightly more expedient way to get Mycroft to open up? 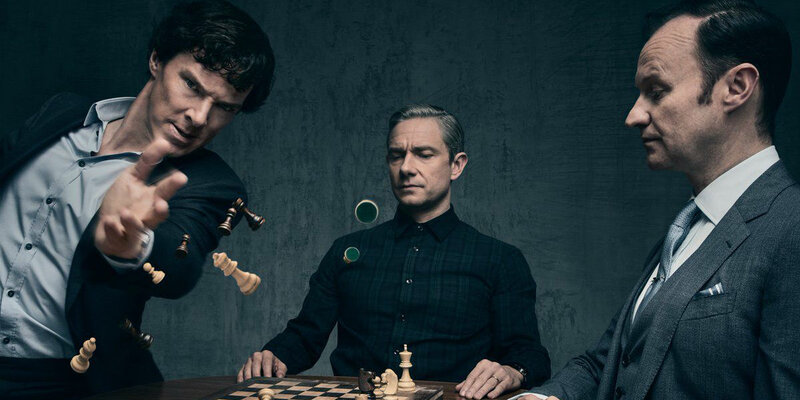 Sherlock and Mycroft's long-lost sister (Sian Brooke) sends a drone armed with a patience grenade (more on that later) to 221B Baker Street to blow up the two siblings for whom she has spent five years dreaming up an elaborate sadistic game (again, a plot hole in itself). Fortunately for Eurus, the grenade doesn't actually kill Mycroft, John or Sherlock. In fact, it doesn't even appear to singe their eyebrows; nor do John or Sherlock suffer any bumps or bruises after jumping out of a second story window, as in the very next scene they're cheerfully hijacking a fishing boat with no visible injuries. If there's a time gap here, the episode doesn't mention it. The final montage of the episode establishes, almost as an afterthought, that Mrs. Hudson also survived the attack - also apparently unscathed. And as for the flat itself, well, it just needs a bit of a tidy up and it's as good as new. Which begs the question... what exactly was the point of blowing it up in the first place? Who Set Up Eurus' Game? "The Final Problem" rather glosses over the question of how Eurus, powers of manipulation notwithstanding, was able to brainwash the entire staff of a maximum security prison into doing her bidding. The episode offers the explanation that they're just following orders, but when those orders include ferrying the most dangerous inmate in the asylum back and forth between Sherrinford and London and stringing up three apparently innocent men to be dropped to their deaths on cue, you'd think that at least one guard or janitor or helicopter pilot would start to question the situation. Eurus' game (which has been widely compared to British game show The Crystal Maze) must have required a lot of work, even outside of the kidnapping and murder: ordering a Molly Hooper-sized coffin and having it shipped to the top-secret island; rigging up a series of screens set to show footage of Moriarty at the press of a button (accompanied by a change in lighting); and setting up cameras in Molly's apartment, just for a start. That leads us to the question of just how she pulled off this Dr. Evil-esque feat. In order for Eurus to do everything that she does, it's clear that she must have a lot of money to spend (on drones and grenades and secret cameras and disguises), and an army of unseen peons to carry out her bidding. The best explanation for this, although it's unclear in the episode, is that she is using Moriarty's resources - even more than a year after Moriarty's death. The nature of Eurus and Moriarty's partnership is somewhat ambiguous, though certainly it seemed to involve a lot of video recording sessions. Was Moriarty under Eurus' control, or were they working together? Did Moriarty give Eurus carte blanche when it came to his criminal fortune, even after his death? Was Moriarty's suicide part of Eurus' plan? Apparently so, since the episode suggests that her deductive genius allowed her to accurately predict the future even as far as five years in advance. Basically, you have to get on board with the idea of Eurus' bottomless bank account and legion of obedient foot soldiers, although they're never really brought up. This part of her plan is a Pandora's box of plot holes; if you start asking questions, you'll never stop. How Did Anyone Get Anywhere? Sherlock's showrunners have never really been fans of the nitty-gritty of transportation - as evidenced by the season 4 premiere, which saw Sherlock and John casually hopping continents in order to track down Mary. As such, we never learn exactly how Eurus manages to sneak back and forth between the maximum security island prison and London, appearing in a variety of disguises and showing up regularly for John's therapy sessions - all without Mycroft ever finding out that she's left Sherrinford. Fans might chalk this up (like many other things) to Eurus' indomitable genius, but that's little better than saying "a wizard did it." The question of how people get from one place to another really rears its head, however, when Sherlock and John are transported from Sherrinford to the Holmes family estate in the space of a single cut. During this time, John is chained up at the bottom of a well and Sherlock is put inside a fake prison cell with collapsible walls that has been built on the Holmes' front lawn (yes, really). Are we to assume that Eurus brainwashed a helicopter pilot to the extent that they transported an extremely dangerous inmate, Britain's most famous detective, and Britain's most famous detective sidekick (both unconscious) from the island to the mainland without any questions? Why Wasn't Victor Trevor Found? "The Final Problem" makes a point of emphasizing that young Eurus' riddle song was too complex for anyone to figure out - even Sherlock. However, Mycroft also says that Eurus began referring to Victor as "Drowned Redbeard," and himself states that this is pretty unambiguous. The reveal that Redbeard was a boy, not a dog, raises the question of why so little effort was apparently made to find him - for starters, by searching nearby bodies of water. Generally speaking, parents and police tend to raise a bit of a stink when a child goes missing under suspicious circumstances. Perhaps the well that Victor Trevor was drowned in was some kind of secret well that nobody - not even the rest of the Holmeses or the local council - knew existed, but which Eurus stumbled across one day. However, if that is what happened then the episode doesn't show it. We also have to assume that Eurus, in her emotionally-wracked, childlike state, was collected enough to tell Sherlock the location of the well in time for the police to show up and rescue John. Oh, and at some point John got the chain off his leg. So all's well that ends well. Those are the things that we found most baffling about "The Final Problem." Do you disagree with our judgment, or did you find a plot hole of your own? Let us know in the comments.